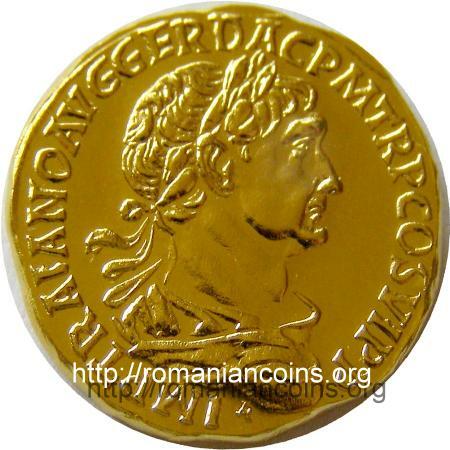 The pictures of the replicas of aurei from emperors Trajan and Hadrian above are present on Romanian coins through the kind permission of Mr. J. Ardelean. This set of four replicas was issued to mark 1900 years from the Dacia's conquest by the Romans, from the organizing of the imperial province of Dacia and from the beginning of the Dacia's Romanization and of the Latinizing of the Carpathian-Danubian space. 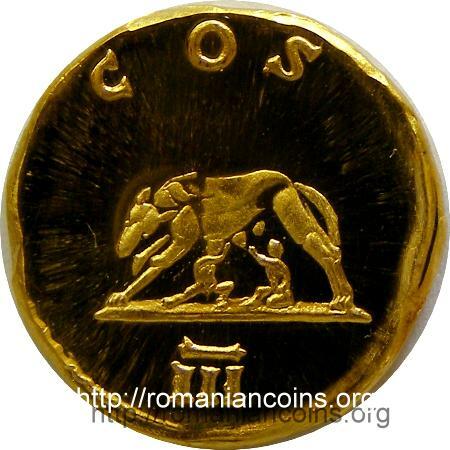 All the original coins were issued after 106 AD and are connected to Dacia or with symbols of the Latinity of the Romanian people (the column, the she-wolf). The set was issued during the 11th Reunion of the International Organization of the Francophony, that took place in Bucharest between 25-29 September 2006. In honor of this event the pamphlet that came with the coins is written in Romanian and French instead of Romanian and English, as usual. and means "to emperor Caesar Nerva Traianus Augustus Germanicus Dacicus, Supreme Pontiff, invested with the tribuneship, consul for the sixth time, Father of the Fatherland". Trajan officialy accepted the title of Optimus princeps in 114, but the title was used even before this year. The title of Trajan was enriched in 102 with the surname Dacicus, after the first war with the Dacians. 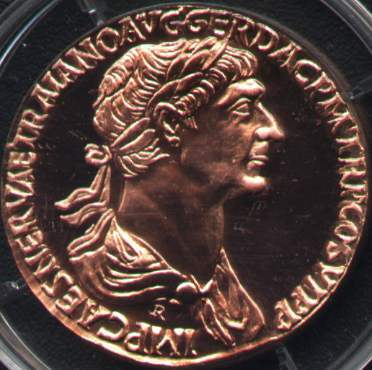 For dating the Trajan's coins we must take into account the years when he was consul: 101 - consul for the fourth time, 103 - consul for the fifth time, 112 - his sixth and last consulate. 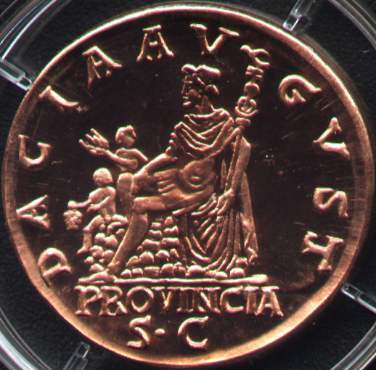 The inscriptions on the sesterce reverse, DACIA AUGUST, in exergue PROVINCIA and S·C, show that Dacia was an imperial province - DACIA AUGUST[I] PROVINCIA. SC shows that the coin was struck with the consent of the Senate, after a decision of this institution - SENATUS CONSULTO. 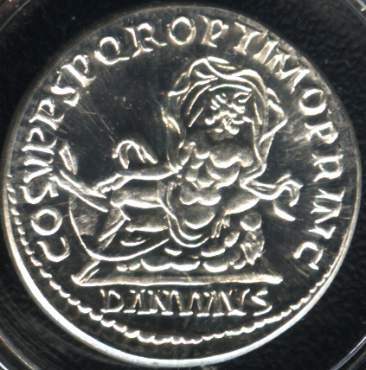 The inscriptions on the denarius and aureus are almost identical. 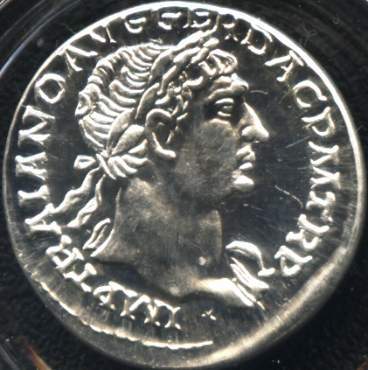 The denarius was struck after the fifth consulate of Trajan and PRINCIPI was truncated to PRINC. and mean "to emperor Traianus Augustus Germanicus Dacicus, Supreme Pontiff, invested with the tribuneship, consul for the sixth time, Father of the Fatherland, the Senate and the Roman People (dedicate) to the best first citizen". Hadrian was consul for only three times, the last time in 119 AD. After 119, inscription III appears on the coin. 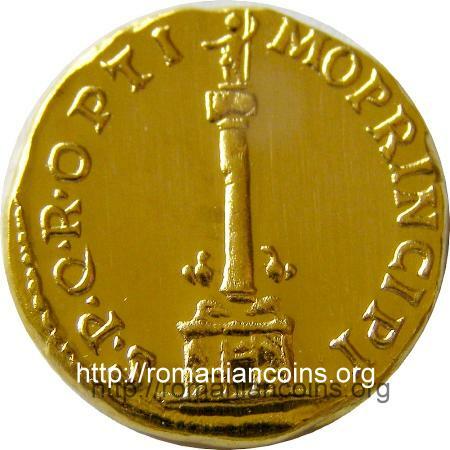 The title Pater Patriae - that appears on the coin immediately after COS III - was received by Hadrian only in 128 AD. 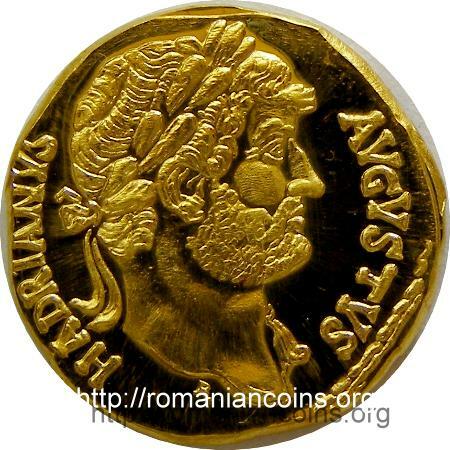 The legend HADRIANUS AUGUSTUS appeared on the coins around 124 AD. So, this coin was struck between 125-128 AD. From the book "Roman Art and Imperial policy" written by Niels Hannestad we found that the diminishing of the coin legend and the portrait of the emperor composed only from head and neck, portrait extended almost on the entire flan, was made in order that the coins be more similar to the Augustus coins (Hadrian was a great admirer of the first emperor, the coins of which bear legend Caesar Augustus). Marcus Ulpius Traianus (53-117 AD) was born in the city of Italica in Spain. He was adopted by emperor Nerva and followed him at the rulership of the empire in 98 AD. Trajan is the first emperor born outside Italy. After the Dacian Wars (101-102 and 105-106) he established the imperial province of Dacia, that included a great part of Decebalus' kingdom. Between 114 and 117 AD Trajan carried a military campaign in the Orient, fighting against the Parthians. In the newly conquered territories he created the provinces of Mesopotamia, Assyria and Armenia (abandoned by Hadrian). Trajan financed - from Dacian spoil - great construction projects, especially in Rome and Italy. He built the Trajan's Forum, with the Latin and Greek libraries and with Trajan's Column, the new harbor of Ostia. He dammed up the Tiber, built the bridge over Danube at Drobeta, repaired and extended the Italian roads. Trajan allowed the Senate to collaborate with him at the rule of the empire, but without renouncing at the prerogatives achieved by the previous emperors. Publius Aelius Hadrianus (76-138 AD) was born in the city of Italica in Spain. He was adopted by emperor Trajan and ruled the Roman Empire from 117 to 138 AD. During the Dacian Wars (101-102 and 105-106) he was one of the commanders of the army. He travelled through the entire empire for many years. Hadrian discarded the provinces conquered by Trajan during the Parthian campaign from 114-117, adopting a defensive policy. Having an encyclopaedic culture, he was nicknamed Graeculus, little Greek, due to his philo-Hellenism. After the death of Hadrian the throne of Rome was occupied by Antoninus Pius, his adopted son.